I gave up watching this film after 45 minutes. It was so boring. The dialogue seemed predictable. The torture scenes again while awful were what I expected and the hard unquestioning nastiness of the good guys mad the bit I watched a complete turn off. Maybe if I knew nothing before I watched, it would not have been so bad. I expected some exhilaration or some interest but all I got was an intense sense of boredom. Sometimes I catch a fascinating TV documentary Today it was on the artistic movement the Pre-Raphaelites. What a rich story of art,artists, power, patronage and social change. A small group of outsiders identified a lock on artistic expression by artistic leadership. 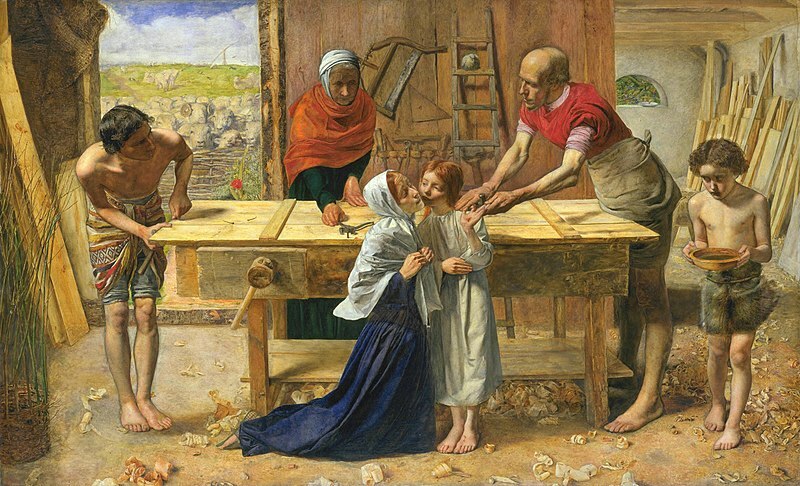 They sought to break out through creating a realist approach to both religious and secular subject matter. Kept as outsiders till an article in the Times by cultural patron John Ruskin.they emerged to shake up artistic expression that still has influence today. Above is Jesus in the house of his parents painted in mid 1800s, It shocked the religious people and the art in-crowd because of its realism. I saw a multi-part dramatic reenactment of this group on TV years ago and was impressed to find out at that time that Andrew Lloyd Weber was an enthusiastic collector of this style of art. Long live those who challenge constricting orthodoxy. The drama series is back on Wednesday morning at 12.35am on ABC 1. It is called Desperate Romantics. Two recent exhibitions in Canberra recently demonstrated the similarities and range available in contemporary still life painting. Harris has a great commitment to rich vibrant colours and objects with striking textures. His traditional still life paintings are small in comparison to his stylized water centred landscapes but both maintain the strong colour palette. Steve Harris was exhibited at the Paintbox Gallery in Braddon. Crispin Akerman has a much more washed out Australian tone to the colours in his set of still life paintings on display in February at the Beaver Gallery. His integration of classic containers and interesting foliage make for attractive images. Black and white drawings often convey awful human experiences with dramatic clarity. 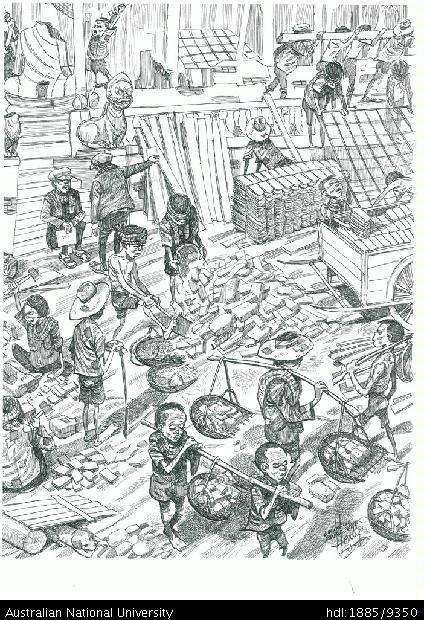 The collection of the drawings created by Ben Heang Ung covering the harrowing period of Cambodian history during the Khmer Rouge rule, do just that. The remarkable 90 creations tell harrowing stories of the lives of people during a time when 2.2 million people lost their lives. I hope that the ANU acts quickly to mount a public exhibition of these in large print form in one of their galleries. Below is a link to a digital set of drawings now held at the ANU donated by the Cambodian born artist Bun Heang Ung. One of my favourite events of the year is to sit in Commonwealth Park and watch the 16 short films that make up the Tropfest. Every year the films engage and amuse us with enjoyable creativity. The winner was a complex weave of what seemed like random people doing good and being blessed randomly with a great tie together at the end. That film seemed to pair with The Hustle which was a pub pool game hustle with a twist. There were less animations this year but the collection seemed to have a vitality ranging from a gangster film using water guns to a remarkable film around a children’s stuffed toy.I hope the free DVD in the Sydney Morning Herald appears on Saturday. There is a gorgeous new exhibition at the National Gallery of Australia (NGA) which opened this week featuring a diverse range of sculptures and other art forms made from a limited range of natural materials. What Vanuatu artists do with tree fern, wood, ochre and Pandanus fibre is wonderful. The sculptures carry cultural significance. The term Kustom is explained on one of the panels as being a process whereby citizens grow in social status through cultural activities. One of the truly engaging parts of the exhibition is a large flat screen on the floor showing a movie of a teenager creating a set of sand drawings in front of you. She draws a framework and then creates a balanced set of flowing symmetrical forms around the centre. The NGA does a great job of these small exhibitions which have been done at a much faster rate since the current director Ron Radford came to Canberra. The disappointing feature of most of their exhibitions is that unless you buy the glossy full catalogue there is no printed information to take away. The policy on photographs is so extreme at the NGA that I feel I will be marched to the door if I take a shot of any of the information panels. The image above is one of the striking portraits that is part of the First Ladies exhibitions. A delightful small exhibition of portraits of some Australian women who have achieved significant firsts is on at the National Portrait Gallery (NPG). The portraits are linked with timeline information on the wall tying the exhibition together. A wide range of women are included in a great range of media. The blessing of using only 26 portraits made it easy for those of us who like reading all the wall panels. The great thing about the NPG is they supplement the exhibition. For those who come to the gallery they have published an informative brochure with full biographies on all the women. For people who do not make it to the exhibition it.is backed by a great section of their website that includes all the biographies and timelines with pictures included. The exhibition is part of the Canberra 100 programs.